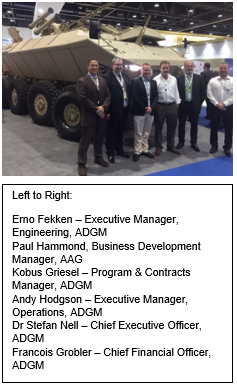 This week at the IDEX Exhibition in Abu Dhabi, Calidus LLC, a UAE Government company who design and manufacture military vehicles and airplanes, unveiled a new 8x8 Infantry Fighting Vehicle. This was presented to the Prime Minister of the UAE, Sheikh Mohammed bin Rashid, together with the Deputy Supreme Commander of the Armed Forces, Crown Prince Sheikh Mohammed bin Zayed. The Wahash was designed jointly with South African company, ADG Mobility, for whom AAG designed and developed a new Air Conditioning and CBRN Filtration Systems to be fitted to the vehicle. AAG has been proud to be part of this new and impressive vehicle.